Briningham smockmill was built by Sir Jacob Astley, 1st Baronet, of Melton Constable Hall in 1721 and a tablet over what was the east door that later became a window bears the inscription IA 1721. The mill did not work for long and Sir Edward Astley, the 4th Baronet replaced the 2 storey wooden tower with a cylindrical 3 storey brick tower at some time between 1771 and 1780. This new tower was built over the existing 3 storey brick octagonal base and was castellated with conical cupola roof to a height of around 50 feet. The base is the only one of its type in the county and is also the oldest base in the county. 3 storey octagonal brick base. At ground level each side 10ft. giving external diameter, wall to wall, about 24 ft. Walls are staggered in four sections, the three lower ones being vertical, heights of 7ft. 6 ins. & 7ft. & the fourth sloping inwards slightly, 9ft. high, about 29 feet in all. As remaining, tower about 50ft. high. Original dorway to east converted to window. Original wiondows on 1st floor:- east, still open, south & west bricked up. Doors & original windows have brick arches; later windows all squared. 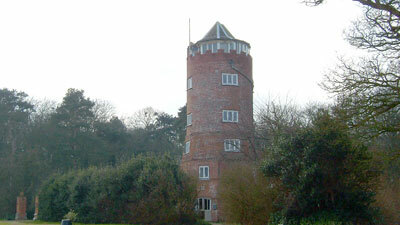 The windmill was the first recorded windmill in Norfolk to ever be converted to residential use and became a residential folly known as Belle Vue Tower. ... Melton ... Sir Edward Ashley at this place has a large park ... From a windmill near the park is a prodigious view of a rich woodland country, fully intemixed with cornfields & wanting nothing but a river to be complete. 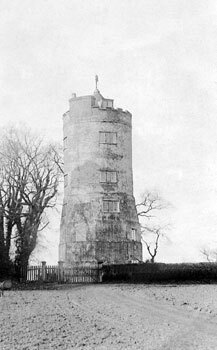 The tower, now called Belle-view was originally a windmill; it is commodiously fitted up; the apartments and furniture elegant & the look out at the top affords a prospect of sea & land twenty five miles each way. The view from Edgefield_windmill & Melton BELLE VIEW is incomparably picturesque & extensive. 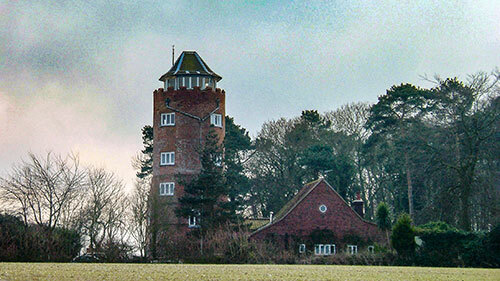 On the north side of the parish is a tower called Belle Vue, belonging to Lord Hastings, and commanding extensive views. 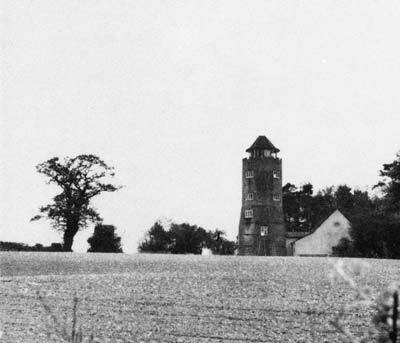 On the north side of the parish is a tower about 60 feet high, called Belle Vue, as it commands extensive prospects. It is the property of Lord Hastings, and is occupied by his gamekeeper. 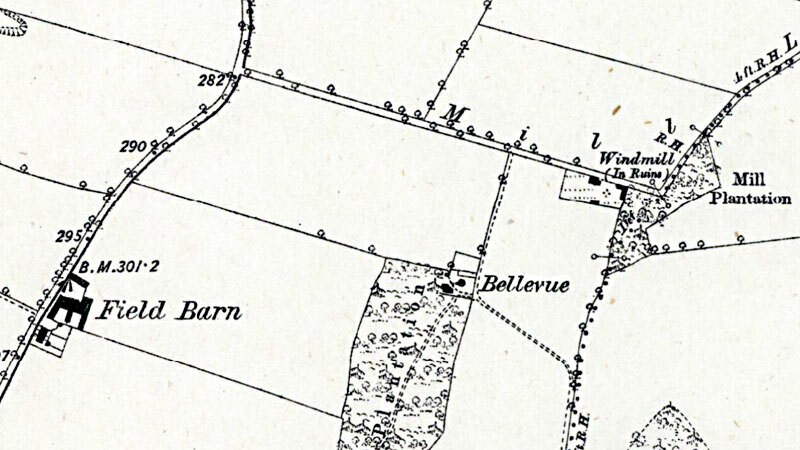 The mill was in Mill Lane and was situated above the site of two postmills that were further down the same lane. 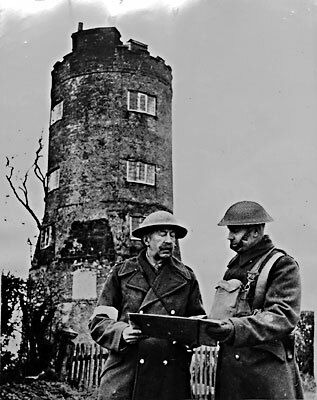 Having become derelict of the course of time the tower was being renovated by Mr. P. Wellard of South Creake at around the time it was put up for sale in 1980. Work incomplete, seems to have stopped some time ago. Inside walls of rooms in round tower have been made octagonal in plan to match smock mill base. Water tanks in new top floor look-out. Access to property very bad after recent rainy weather. I, BENITA HIDE, of Belle Vue Tower, Briningham near Melton Constable, Norfolk, having during the past six months carried on the trade or calling of Shopkeeperhereby give you notice that it is my intention to apply at the Transfer Session for the said Licensing District to be held at the Court House, Holt Road, Cromer, on Thursday, December 5th next, at 10.30a.m., for the grant to me of a Justices' Licence authorising me to sell by retail intoxicating liquor of all descriptions for consumption off the premises situate at 35, Market Place, Holt, Norfolk, and known by the sign of "The Holt Cheese Shop & Delicatessen" of which premises Mr. Clive Buckle is the owner. Dated this 11th day of November, 1985. NORTON PESKETT & FORWARD, Solicitors & Agents for the Applicant). 148, London Road North, Lowestroft, Suffolk. Offers in excess of £200,000. Has been listed Grade 2 as being of outstanding architectural or historical interest and as such is described as a Smock Mill. Elizabethan "Standing" or Folly with 18th century additions, beautifully converted into a family House with outstandiong views and about 9 acres. Unique and historic original Smock Mill standing in splendid isolation with 9 acres of woodland. Six-storey mill tower giving panoramic views. Joint sole agents with Messrs. Savills. Mill advertised again in the EDP by John Marsh on 24th October 1987, indicating that the previous SALE AGREED had fallen through.